1. I had as much fun assembling and playing with the Seedling Marble Run and Virtual Reality maze as Hudson. And we haven’t even gotten to the VR aspect yet! 3. Equilibloc can be played up (like reverse-Jenga) or down—or simply used for imaginative construction play. I love Janod’s colored wood toys. 4. Like their other maple-wood toys, Wooden Story’s Rainbow Stacking blocks are colored using oils and wax and are worthy of keeping for years. 20% of the sales of this one will be donated to the play area of UCSF Benioff Children’s Hospital by the shop, Over the Ocean. 5. A real first camera. We started with this one when Hudson was a toddler—and the kids still love it—but the images aren’t great. 6. This birch plywood DIY Modular House Kit can be taken apart and reassembled in many different forms, to inspire more creative play. 7. Illustoria Subscription, a magazine for creative kids and their grownups just released their 2nd issue, and would be especially suited to that 6-12 age range. 8. We picked up these Travel magnetic tiles when we were in Los Angeles and they’ve gotten a lot of use on flights and at restaurants. A win for everyone. 9. Beginning slackline that can be set up anywhere to get those wiggles out. A good exercise for everyone in the family, in fact. 10. Cubebot. Inspired by Japanese Shinto Kumi-ki puzzles, and made from beech wood, it can hold dozens poses with his elastic-band muscles or fold up into a cube. Great for busy little hands. 11. Fjallraven just knows good design. Everyone raves about this for a first backpack: the fabric is water resistant and durable, the straps well-positioned and comfortable, and the little handles mean you can easily carry it for little ones when they grown tired, or toss it over a stroller handle. 12. Books are always a good idea! Some that might please? Food Anatomy, Ah-Ha to Zig-Zag, Book With No Pictures, or The Lion And The Bird (so beautiful!). 13. Adults will appreciate the design of this game of Go Fish, illustrated by Richard McGuire, and kids will have fun playing. Here are more games they’ll want to play over and over: Uno, Sequence for kids, Memory, Outfoxed, Connect 4, and Tangoes (this last one is new to us, and challenging enough for everyone to enjoy). 15. What kid isn’t thrilled by Temporary Tattoos?! P.S. 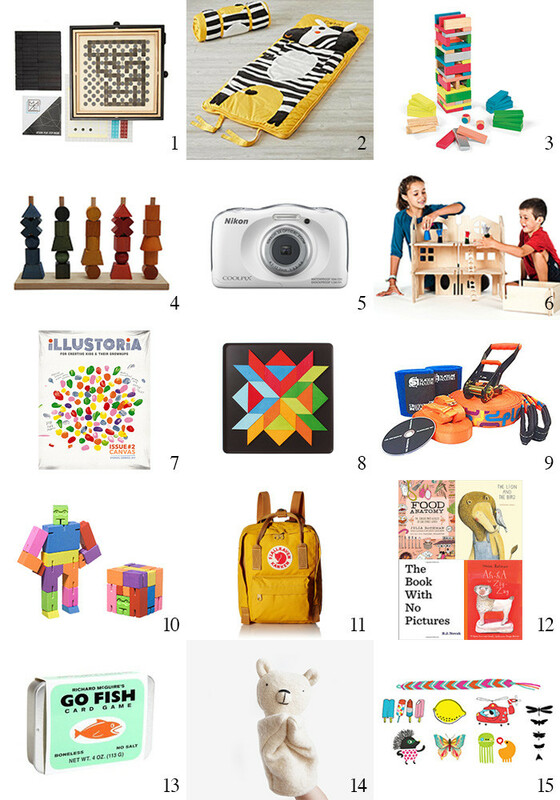 More gift guides for kids, checked for updates: 2015, 2014, and 2013. Again, the suggestions still hold! Plus, best books for preschoolers. Who needs the high kicks?